Deo Fresh neutralises bad odours and freshens shoes. Mr Frédéric Pfirter created the company Famaco in 1931. Today, Famaco is still run by the Pfirter family and its headquarters, as well as its production plant are based in Châtillon, near Paris. 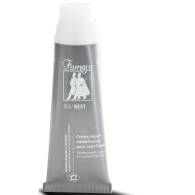 Today, Famaco is the only manufacturer to offer a range of over 100 different colors of shoe polish creams. Their knowledge and continuous research allow them to combine tradition and innovation. With the development in chemical technology, they have been able to combine traditional wax such as beeswax or carnauba wax with more innovative products. Vaporiser à l’intérieur de la chaussure.